A young shagbark hickory tree. 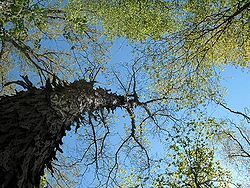 Looking up the trunk of a shagbark hickory tree. 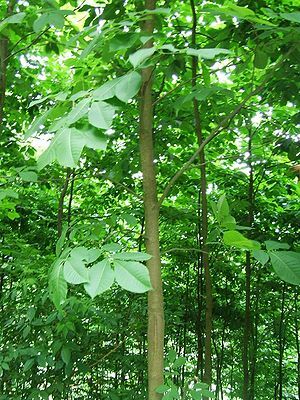 Hickory is a deciduous tree of the genus Carya found principally in North America, native to the east part of the continent from south-east Canada to the eastern United States and north-east Mexico. Hickory is the hard, tough, heavy wood of such a tree, which is used e.g. for walking sticks, tool handles, sports equipment (e.g. skis), and for smoking ham. Switches cut from Hickory trees are traditionally popular implements for spanking. A hickory stick is a kind of stick or cane made of hickory. Unlike a switch it is not freshly cut before use - it is made of dry wood and can be used over and again. While rattan canes never caught on in North America, the hickory stick has also been a frequent, feared implement for school discipline, before it gave way in the US almost exclusively to paddling. This page uses content from Wikipedia. The original article was at Caning. The list of authors can be seen in the page history. As with Spanking Art, the text of Wikipedia is available under a copyleft license, the Creative Commons Attribution Sharealike license.